The Civil War represented a momentous change in the character of war. It combined the projection of military might across a continent on a scale never before seen with an unprecedented mass mobilization of peoples. Yet despite the revolutionizing aspects of the Civil War, its leaders faced the same uncertainties that have vexed combatants since the days of Thucydides and the Peloponnesian War. 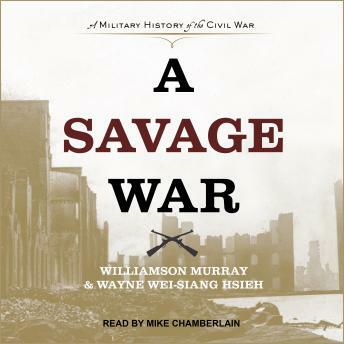 In a masterful narrative that propels listeners from the first shots fired at Fort Sumter to the surrender of Robert E. Lee's army at Appomattox, Williamson Murray and Wayne Wei-siang Hsieh bring every aspect of the battlefield vividly to life. They show how this new way of waging war was made possible by the powerful historical forces unleashed by the Industrial Revolution and the French Revolution, yet how the war was far from being simply a story of the triumph of superior machines. Murray and Hsieh paint indelible portraits of Abraham Lincoln, Ulysses S. Grant, William Tecumseh Sherman, and other major figures whose leadership, judgment, and personal character played such decisive roles in the fate of a nation. They also examine how the Army of the Potomac, the Army of Northern Virginia, and the other major armies developed entirely different cultures that influenced the war's outcome.